Safe shopping is important to everyone and we have gone to great lengths to make sure your details remain safe. When you browse our store, or start the order process, you can be sure that every step of the way is 100% secure. This means that NOT ONLY is your purchase, credit card data and personal information secure, but your entire shopping experience, every page, is secure. And even better, when you finish checkout, we permanently delete your credit card information. We don't store it, or save it. This means you must re-enter your credit card information on every purchase, but it provides the best security you can expect. We have compiled a list of frequently asked questions below, which you may find useful. As soon as you enter the store, every bit of information that is transferred between you and us is encrypted using powerful encryption algorithms. So even if someone could intercept the data over the internet, there is not a thing they could do with it. How can I tell if Rings-N-Things is secure? The URL of a standard page will begin with "http://". A secure web page will begin with the URL "https://" denoting that the merchant is using a secure server for the transaction of data. It is easy to determine if your connection is secure; on your browser you will notice a picture of a small padlock - this normally appears right at the top of the browser window, with a green color in front of the URL, or if you are using Internet Explorer it may appear after the URL. Click on the padlock and follow your browser's prompts to view the details of the secure certificate and the issuing authority. 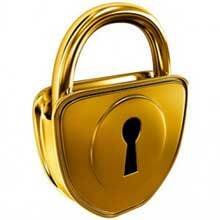 All credit card details are encrypted using GlobalSign 256bit SSL (Secure Sockets Layer) Software. When you establish a secure connection, the downloaded web site sends a digital certificate to your web browser. When the certificate arrives, it contains a public key, which functions as a one-way encryption device. The browser then uses this key to scramble your personal data (Credit Card Information) before sending it over the Internet. Information encrypted with the public key cannot be decrypted without the corresponding private key, which only the merchant has. Without this exclusive, private key, your personal information cannot be read. The second way to ensure you have a secure connection is to look for a GlobalSign logo and only purchase from merchants you know and trust. Here again, the digital certificate is important. In addition to encrypting the data you send over the Internet, the certificate can be used to confirm and authenticate the identity of a web site"s owner (in this case, the merchant). Because digital certificates act as electronic signatures they cannot be forged, you can be certain the connection is secure if either RSA DATA SECURITY INC. or GlobalSign Inc has issued the certificate. GlobalSign, Inc. is the leading provider of digital authentication services and products for electronic commerce and other forms of secure communications. For more information on GlobalSign please visit their web site at http://www.GlobalSign.com.